With the immense grace of Sri Swamiji and Madhuri Sakhi Sametha Sri Premika Varadan, Houston Namadwaar was filled with 7 days of blissful Guru smaranam from Dec 26 (Mon) to Jan 1 (Sun), as it rang continuously with Mahamantra sankirtan, Sri Swamiji’s kirtans, Srimad Bhagavatam parayanam and pravachan, and devotees sharing their experiences about Sri Swamiji. Sri Poornimaji from India led and guided the events throughout the week, and her presence made a significant impact on the devotees and the community. 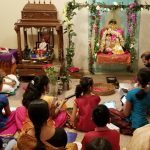 Several devotees came to Houston Namadwaar for this Srimad Bhagavatam and Nama Saptaham Utsav from across the USA, including California Bay Area, Chicago-Illinois, Holland-Michigan, Milwaukee-Wisconsin, Richmond-Virginia and Dallas-Texas. The entire atmosphere was joyous and filled with love and laughter, and it was truly a “family” reunion. Conducted in the presence of the Holy Padukas of Sri Swamiji, each day of the utsav began with Prabodhanam and was followed by parayanam of select verses and chapters from Srimad Bhagavatam and singing of Sri Swamiji’s kirtans. Akhanda Mahamantra sankirtan was performed from 10 AM to 4 PM daily. In the evenings, between 5 and 6:30 PM, several different programs were held including many children’s programs. This was followed by a discourse series which turned out to be completely about Guru Maharaj. On the first 2 days, Sri GBji from California spoke about his experiences with Sri Swamiji. 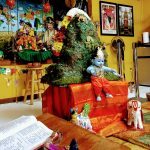 On the 3rd day, Sri Ramaswamyji from California spoke about his recent trip to India and about his interactions with Sri Swamiji. On the 4th, 5th and 6th days, Sri Poornimaji took the stage and spoke wonderfully on Satsang Mahima, the greatness of Srimad Bhagavatam and 11th canto, while at the same time talking about the greatness of a Guru with examples from Sri Swamiji’s life. On the final 7th day, 4 devotees — Priya Thulasi ji from Milwaukee, Mayakoothanji from Dallas, Kishoreji from Atlanta and Laxmiji from Houston — shared their experiences. The daily program always ended with Dolotsavam. On 26th and 28th, a Youth Talent program was conducted where several children performed — there were Hari Katha performances by Muktha Nair and Varshitha Krishnan, short pravachans/story-telling by Sanjev Kalyan, Mukund Nair, Kishori ZivanPrakash and Shreshta Thulasi, Violin recital by Maya Iyer, Guru Paduka stotram and Bhagavad Gita Chapter 10 recital by Maitreyan Ganesh. On 27th evening, a fancy-dress performance was held where 13 kids dressed up as various characters from our scriptures or as Bhagavatas. The participants were Mukund, Bharat, Madhura, Haritha, Haricharan, Kishori, Meera, Arpan, Madhuri, Rutvik, Prithvi, Archana, Shreshta Narayanan. 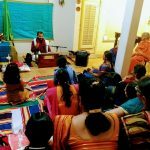 On 30th evening there was a Madhura Gitam concert of Sri Swamiji’s kirtans, first by the little singers of our satsang, and later by the satsang ladies. On each day, a special chief guest was invited for the evening program and honored by Sri Poornimaji. The guests included Sri Mahesh and Smt. Bhavani Iyer, Smt. Prathibha and Sri Sanjeev Sachdev, Smt. Uma Mantravadi, Smt. Thara Narasimhan and Sri Sathish Rao. On 26th, Kruthi and Keerthana Bhat, daughters of well-known singer and music teacher Smt. Rajarajeshwary Bhat, melodiously led the Mahamantra sankirtan for about an hour in the afternoon. Their parents were also present to enjoy the sankirtan. 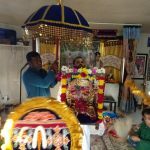 Other highlights of the week included a Nagara Sankirtan and Vana bhojanam on 27th afternoon where Sri Swamiji’s picture was carried in a palanquin — while devotees chanted Mahamantra — to a nearby park for Vana bhojanam, a Paduka purappadu (procession) around Namadwaar while singing Sri Swamiji’s kirtans on 29th evening, Divya Nama Sankirtan on 30th night, and a special New Year’s eve cultural program that included a Bhakta Meera play (in English) by Gopa Kuteeram children from across the USA and a Madhura Gitam quiz on Sri Swamiji’s kirtans. 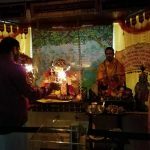 Sri Ramanujamji delivered a special, inspiring New Year message via telephone right before the stroke of midnight on 31st, and the entire gathering welcomed the New Year with Mahamantra chanting. 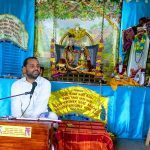 On New Year’s Day, Sri Swamiji’s mass prayer in India was telecast live at Namadwaar and several devotees in Namadwaar enjoyed the talk and chanted the Mahamantra along with Sri Swamiji. The whole event went wonderfully well and was enjoyed immensely by all those who were fortunate enough to attend it, by His Grace. It was a most auspicious and memorable welcome to the New Year!